A pomegranate bush is what you’ll typically get if you allow a pomegranate seed to grown naturally (no pruning). If you purchase a pomegranate plant that is already potted, it’s likely that you’ll get a bushy plant from that too, unless you take to pruning it. Do you want ornamental foliage around your house or in your garden? A bushy pomegranate plant could be just the right choice, especially if you’re not typically good at keeping plants alive on your own. This hardy plant takes very little to grow, so it’s the ideal choice for hobby gardeners or those who aren’t home much to foster the care of a garden or flowerbeds. The bushy pomegranate plant will provide beautiful green foliage during the spring and summer and then in the fall, you’ll get the privilege of enjoying bright golden foliage. Instead of the drab look that most bushes will take on in the fall, the bush will literally shine with color during these months leading into winter. When spring arrives once again, you’ll be treated to beautiful bronze leaves first and then gorgeous blooms in colors that will remind you of a summer sunset. There are varieties of pomegranate plants that are specifically cultivated to produce large, apple-size fruit in the fall. However, many of the varieties of the bush are cultivated and grown simply for ornamental or decorative purposes. If you desire to have fruit-bearing pomegranate plants, you may want to consider the ‘Wonderful’ or ‘Angel Red’ varieties of pomegranates. What Does a Pomegranate Bush Need to Grow? Provide the following for the ornamental pomegranate plant and it will do beautifully for you with very little effort on your part. You’ll enjoy a healthy pomegranate plant if you do those simple things each year. An ornamental bush can be kept as short as 1 to 1 ½ feet high or you can get varieties that will grow as high as 8 feet into the air. 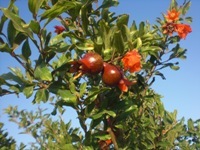 The variety of pomegranate plant you purchase will depend on the location and purpose you want for your bush. If you were planting several bushes as a divider or a front-of-the-house display, the shorter bush would be ideal. However, if you want to add some color and foliage to the corner of your house or garden shed, a variety that attains some height would be perfect. The pomegranate bush is the right choice for you if you love having greenery and spring blooms without all the fuss those high-maintenance flowers and plants require in order to thrive. Check your local nursery for plants that have a good healthy start this year and see how easy these plants are to plant and grow in your own backyard. 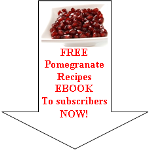 Read enough about pomegranate bush and want to discover more about the pomegranate tree?